Laying flat on the floor, bend the knees with feet flat on the floor, knees pointing up to the ceiling, arms alongside your body. Press into your arms, with your feet remaining on the ground, and move the hips away from the floor, opening your chest. This asana is very easy to do. Anybody can do it just simply, the person who is not flexible enough can do it easily. It will opens the chest. 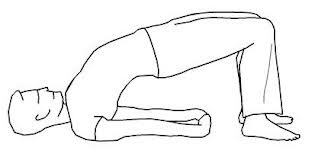 This asana is very useful for the improves spinal flexibility, stimulates the thyroid. It will provide Strengthens legs, upper back and very important. It is very useful for Reducing the backache and severe headache.